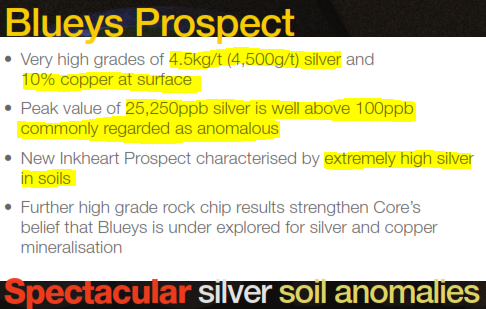 Drilling in the next few months at the Blueys Prospect at Albarta, NT – this is the big one for us, and it’s happening soon... stellar silver grades of 4.5kg per tonne silver, and 10% copper at surface... imagine if drilling discovers “grades at depth”? 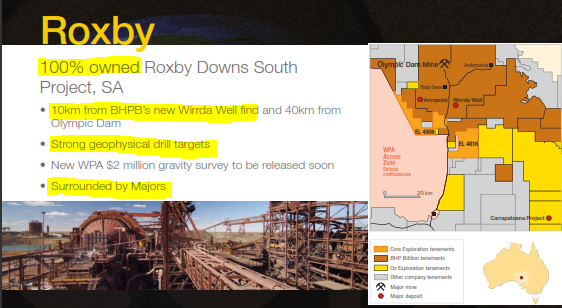 BHP’s imposing IOCG discovery at Roxby Downs – CXO have released drilling targets next door, and the mineralisation BHP found may well continue into CXO’s tenement, only 10km away. Regular readers of our sites will be familiar with our long-standing interest in reporting on high potential stocks that we uncover. Did you receive our recent report on Segue Resources ? Since this report was released, SEG has been up 100%. 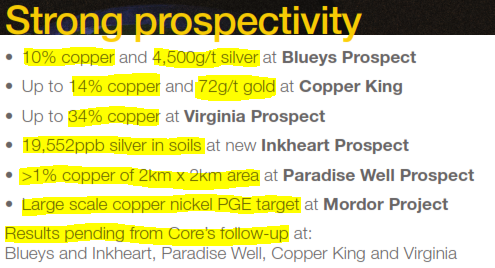 When we heard that CXO controlled swathes of hugely sought after exploration ground, amongst numerous super majors, has a super low market cap that limits downside, and super high surface grades of silver, copper and gold... It got our attention. CXO’s tenements sit directly next door to BHP’s Olympic Dam – a giant IOCG deposit. IOCG stands for iron oxide, copper and gold – an IOCG deposit is a type of metal deposit comprised of intertwined iron oxide, copper and gold mineralisation. IOCG ore bodies are big... really big... generally containing between 10 million and 4 BILLION tonnes of ore, at copper grades up to 5% copper and gold values of around 3 grams per tonne – along with the iron, and often uranium. The tremendous size, simple metallurgy and typically high grade of IOCG deposits produce extremely profitable mines – like Olympic Dam. 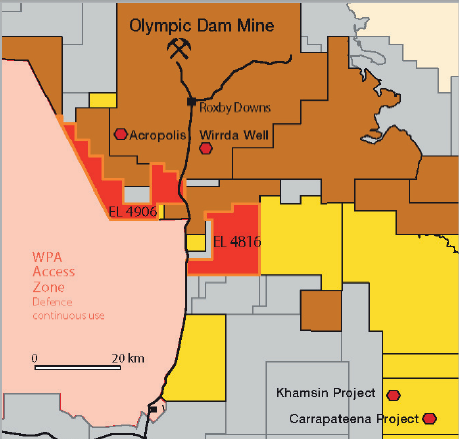 It is well worth spending 5 minutes studying this map of the area around Olympic Dam in South Australia – it takes a while for it all to sink in. 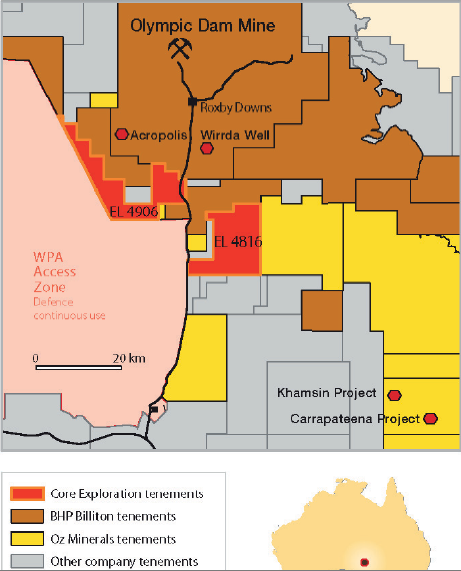 CXO is in a league of its own, as the only listed microcap explorer that controls tenements directly in between Olympic Dam and the Woomera Protected Area . The red areas in the map below are CXO, the brown area with the digging tools is Olympic Dam. Minotaur Resources (ASX:MEP) was part of that league... until BHP took their tenements out in 2012 for $10 million. $10 million doesn’t sound like a huge sum – but that value is over three times the current market cap of CXO. BHP also splashed $8 million to secure tenements from Archer Exploration (AXE). Rio Tinto is keen too, dishing out $10 million the same year for just for a joint venture share in one of Tasman Resources’ projects. The area is definitely a hive of activity – The Next Small Cap is sure that a few of these mining giants will be watching CXO’s movements very closely. Did you catch the Next Oil Rush report on Rey Resources (ASX:REY )? 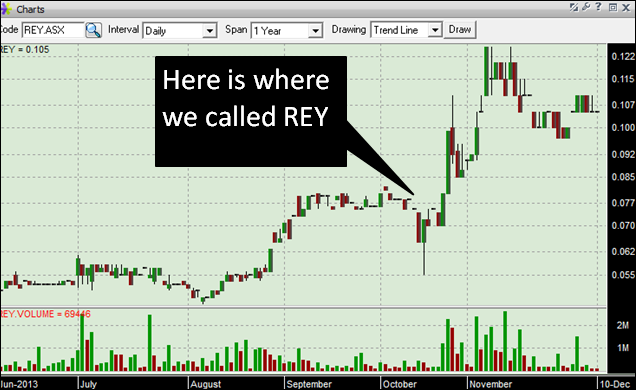 Following our article release, REY has been up nearly 75% since. CXO’s 400km 2 Roxby Downs South IOCG project is just 10km’s from BHP’s recent Wirrda Well IOCG discovery , and 40km’s from Olympic Dam. 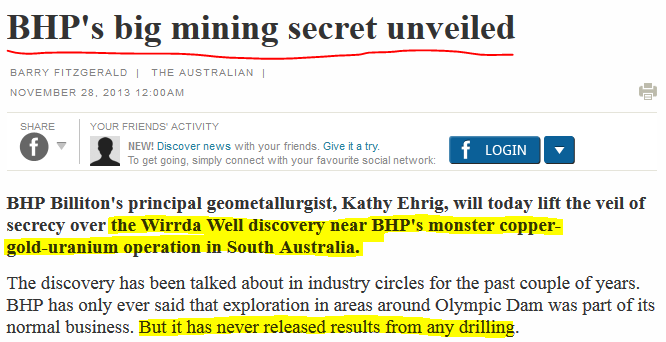 CXO is the single closest neighbour to BHP’s mammoth new discovery, majors included. We see nearology and takeover potential! 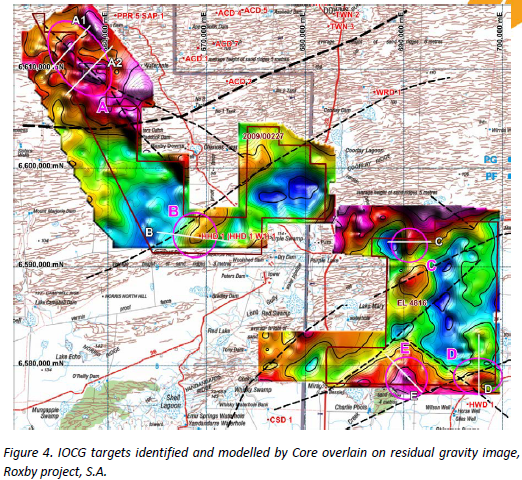 CXO has just identified IOCG drill targets , based on respected data from a new, government sponsored, $2 million gravity survey. CXO is the “piggy in the middle”, and the “middle” is getting smaller and smaller. 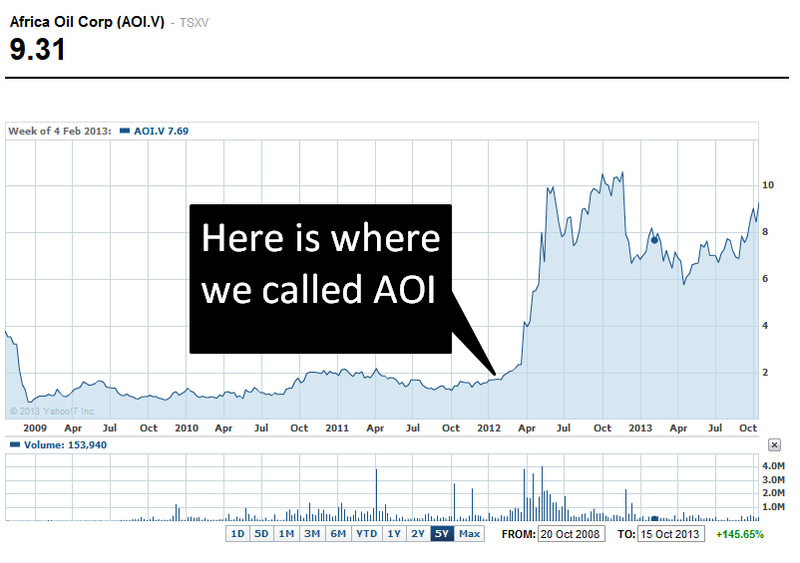 Did you catch our ‘tip of the decade’ – TSX:AOI back in February 2012? The Next Oil Rush called it at around CAD$1.8 and has been as high as CAD$11.25 since – that’s over 600%! In addition to the tenements held in South Australia, at Albarta in NT, CXO have identified and pulled together a set of disparate tenements, to form an organised mega project ... The mega project comprises 20 tenements covering over 2000km 2 . It’s worth squinting your eyes for a few seconds to see the plethora of high grade early results CXO has delivered at multiple prospects in the image below. 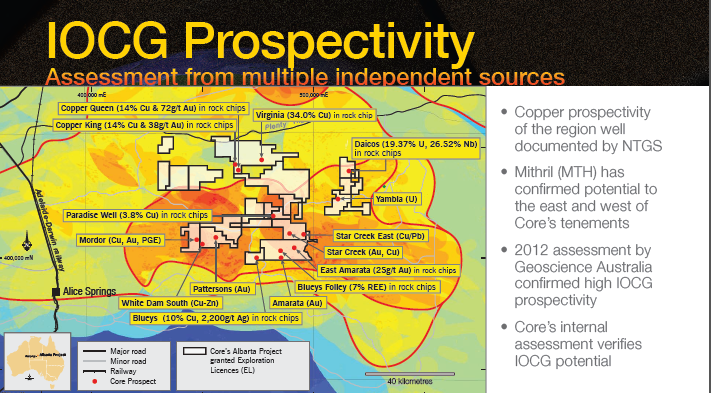 The map captures CXO’s ground at their multi-prospect super project Albarta in the Northern Territory. 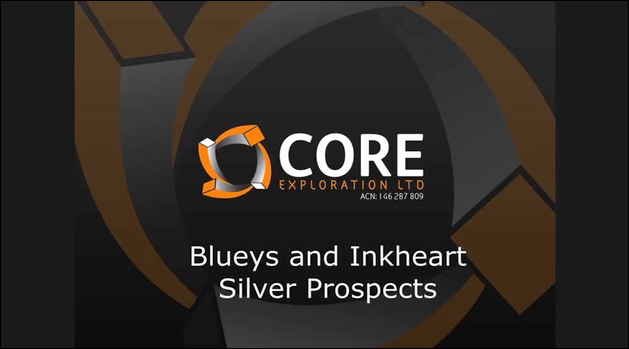 The title of the slide is IOCG Prospectivity – but the silver results are one of the most exciting aspects of CXO’s artillery – and the 2.2kg shown at Blueys has since been upgraded to 4.5kg /tonne . The red/orange areas are those considered to be the most prospective – right where CXO controls ground. Until the drill starts spinning at Blueys, a steady stream of news flow should keep the market eyes fixed on CXO, with fieldwork results from Virginia, Copper King and Paradise Well to be released in the weeks ahead. Following our report on Pura Vida (ASX:PVD) titled Why has this stock got analysts predicting four thousand percent gains? 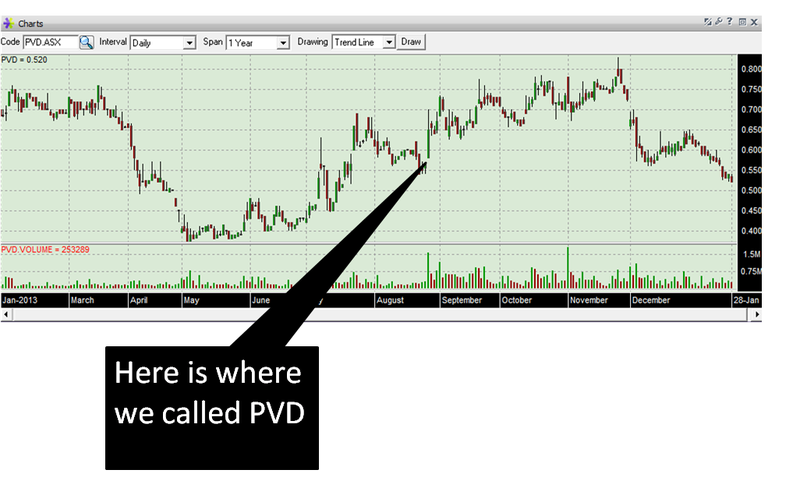 the PVD share price rose as high as 40%. 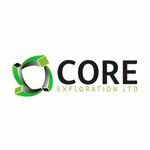 Results to date indicate significant mineralisation at depth. Below are photos of silver and lead chips found in rocks that were just rolling around on the surface of Bluey’s tenement – who knows what’s underground! That is some serious veining that CXO have found. 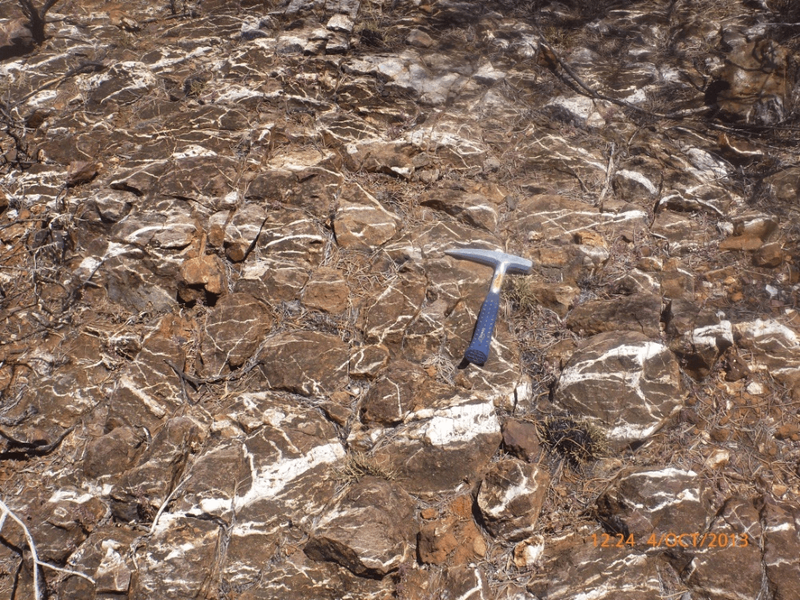 Surface mineralisation, along with widespread veining, also coincides with a big area of silver in soil... over 700m by 400m. 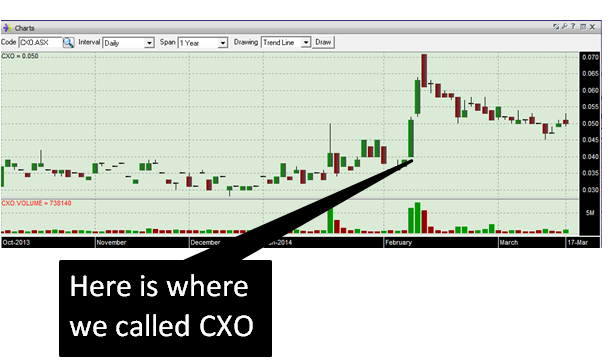 With all these indicators in the same location, CXO have a strong chance of hitting something shiny. 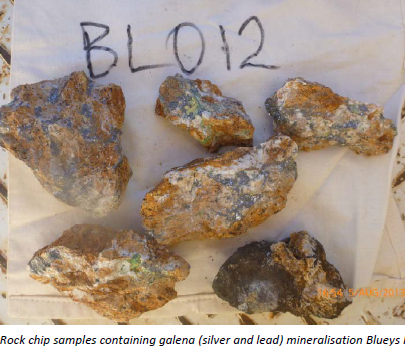 Now, the silver in soil assays of up to 25,000 parts per billion (25 grams per tonne silver) is not too shabby as a drill result, but that amount of silver, just loitering around in loose soil... that’s very unusual . We know a lot of you might switch off when you hear results in parts per billion... but when it’s you consider its 25g/t silver in loose soil at surface, you should switch on... especially when it’s silver. The level of silver in soil considered an indicator of underlying mineralisation is around 100 parts per billion. CXO have 250 times that at Blueys! 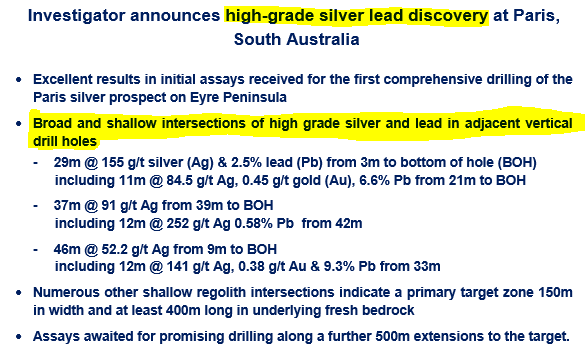 In addition, CXO’s first rock chip sampling results at the Inkheart prospect, just north of Blueys, confirmed significant silver levels at surface. Okay... now hold your breath and concentrate: Geological mapping also identified a metal-rich gossan (an exposed part of an ore deposit) within a newly-identified 1,500m by 250m area of silver in soil, averaging 1000 parts per billion, and up to 19,500 parts per billion at its core. The soil anomaly at Inkheart is now over 2 kilometres long, and it remains open, leaving scope to get much, much bigger. And the geology has been identified as being carbonate ... the copper in rock chips came in their carbonate forms of malachite and azurite, and the lead and silver are also hosted in carbonate, as argentiferous galena. Argentiferous is just a fancy way of saying that a rock contains silver. Are you still with us? Good. This is significant, because carbonate hosted silver deposits are known to be both large AND high grade. Also...the majority of soil samples at Bluey’s and Inkheart are residual, which means they should reflect the geochemistry of the underlying geology. Yes we are total mining nerds. 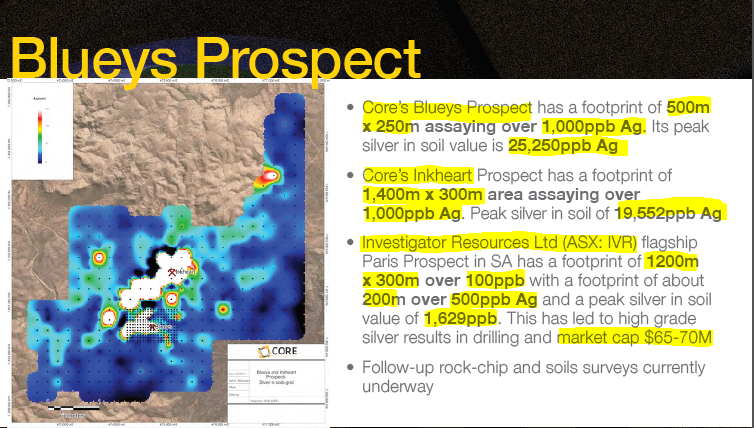 Continuing results of this calibre from Blueys and Inkheart have elevated the prospectivity to a level comparable to the early exploration of Investigator Resources (ASX:IVR), at its flagship Paris silver project in S.A. – more on that below. Did you see our coverage of Trafford Resources (ASX:TRF)? TRF has been up as high as 110% since we called it. The Next Small Cap is very impressed with the exploration track record of the guys that run CXO. Stephen Biggins, CXO’s Managing Director, has over 20 years’ experience as a geologist and geophysicist, specialising in silver, gold, uranium and base metals exploration in Australia and internationally – just the metals CXO are looking for. Most notably, he was the founder of Investigator Resources , and was the early brains behind the Paris discovery that lined the pockets of IVR stake holders . IVR reached a market cap of $70 million based on its Paris silver drilling results. Should drilling results at Bluey’s be of a similar standard, a market re-rating for CXO could be on the cards. Did you see The Next Oil Rush report on Swala Energy (ASX:SWE) titled The last junior oil explorer operating in this exciting region with this same JV partner went up 800% in a matter of months ? 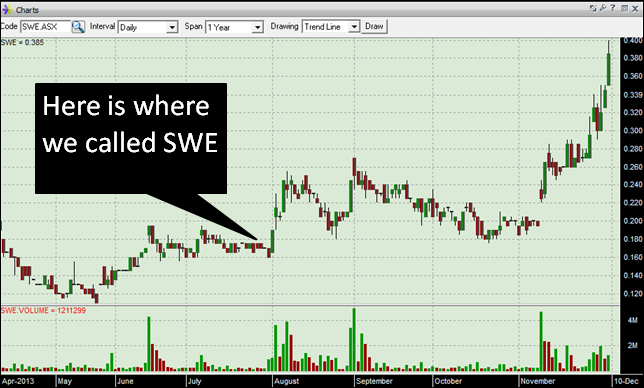 SWE has traded as high as 150% since. Bluey’s – Drilling at Blueys and Inkheart, with the unbelievable silver rock chips of 4.5kg per tonne, along with high silver in soil and clear IP targets – is expected to start in around 8 weeks. 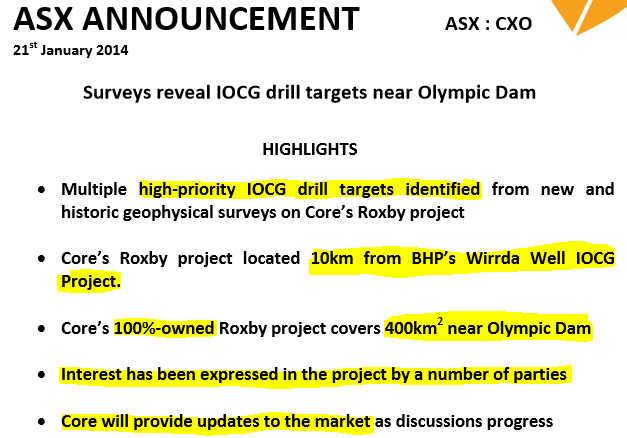 Roxby Downs – Drill targets have just been announced at Roxby, near BHP’s big new IOCG discovery. Drilling at Blueys will take centre stage... and it’s going to get us, and the market, very excited. Did you see The Next Oil Rush report on Citation Resources (ASX:CTR) titled Junior oiler gearing up to drill a giant Guatemalan oil kitchen... and will puncture the behemoth reservoir in just days... ? 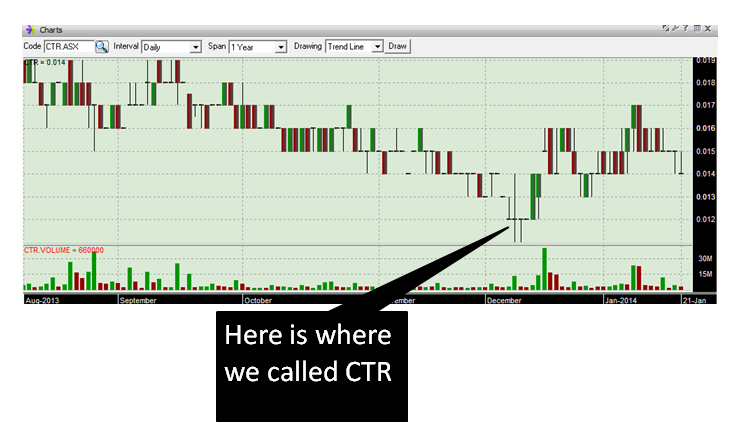 This report showed CTR to be cooking up a storm with the share price rising over 40% after we called it. Management that has done it all before, know what they are looking for and how to find it.